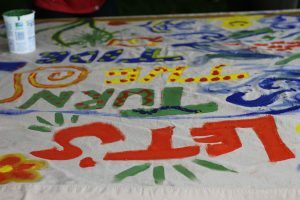 Interested in promoting sustainability on campus? The Eco-Reps are hiring for the Fall 2018 semester! Eco-Reps work under the Office of Sustainability and are agents for environmental change on campus. We are looking for individuals passionate about the intersection between social and environmental issues. Students of all backgrounds and majors are encouraged to apply! Eco-Reps serve all 16 halls that have RAs, including Blakeley Hall at the Fletcher School. A parallel GreECO Rep program serves the Greek Life Community. 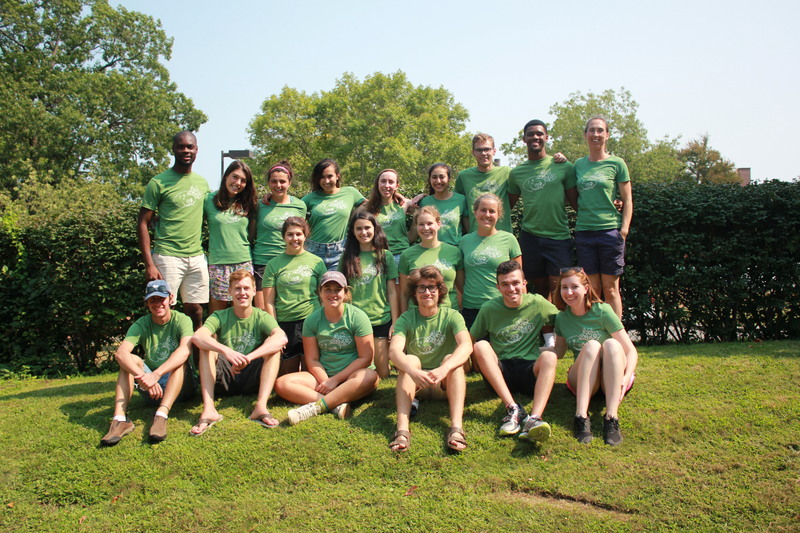 Eco-Reps participate in a week-long training during new student orientation, come to 1.25 hour weekly meetings throughout the academic year (on Wednesdays during open block from noon-1:15pm), and work 3-5 hours per week in their dorm. Eco-Reps are paid $11/hour, and area leaders paid $11.25/hour. At the weekly meetings, the Eco-Reps learn about environmental issues, how Tufts and other entities try to combat these issues, general event planning techniques, community-based social marketing strategies, and other topics of interest. Eco-Reps run events individually and together, plan and lead behavior change campaigns in the dorms, maintain compost bins and bulletin boards in their dorms, collaborate with RAs and student groups, write weekly blog updates, participate in personal challenges, go on field trips, learn about sustainability and environmental issues, put up posters and signs, go to hall snacks, meet with duty teams, send out e-newsletters, make friends and generally have a lot of fun! We encourage all interested students to talk to the Eco-Rep in your dorm to get an idea of what is involved. Your Eco-Rep can also provide a recommendation for you. 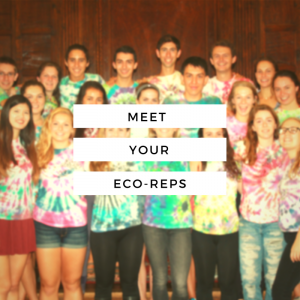 If your dorm does not have an Eco-Rep, contact the Eco-Rep Coordinators for next year at applytuftsecoreps@gmail.com or talk to any of the current or past Eco-Reps listed on our website. You may also view the job description here. Eco-Rep selections are made at the end of the Spring semester for the following year and are based on a written application and an interview. Recommendations are occasionally requested. Additional Eco-Reps may be hired during the last month of the Fall semester to replace Eco-Reps who will not be returning for the Spring semester. Applicants who are self-starters, outgoing, eager to learn, comfortable teaching others and not over committed in other areas of their lives do well in the Eco-Reps program and can make a big difference in their dorms’ culture. 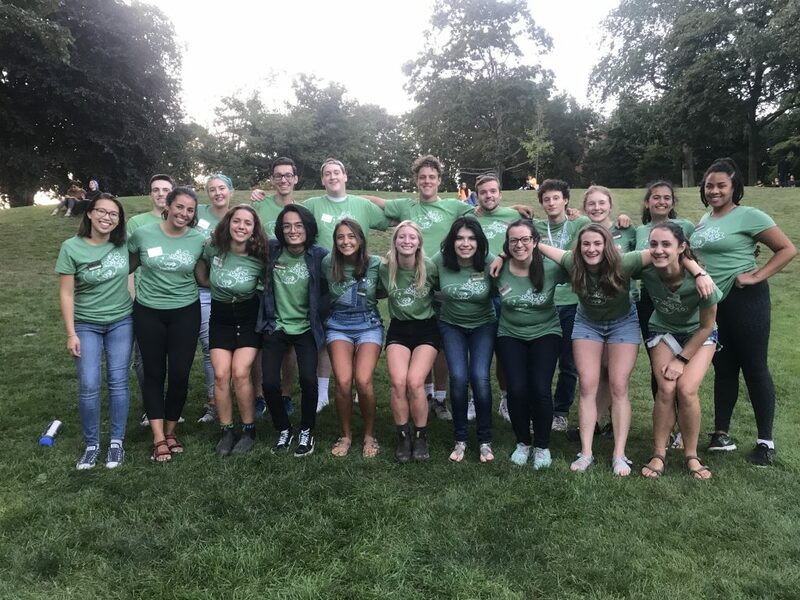 Dorms that currently have Eco-Reps are Blakeley, Bush, Carmichael (2), Carpenter House, Haskell, Hill, Hodgdon, Houston, Lewis (2), Metcalf, Miller, Richardson, South (2), Tilton, West, Wilson, and Wren. In addition, there are two Greek Life Advisors. Eco-Reps are not required to live in the dorm that they work in, but it is strongly preferred. Returning Eco-Reps may live off campus, but first-year Eco-Reps must live in on-campus housing. Every effort is made to assign Eco-Reps a dorm that is close to their own residence. Preference is given to students who will be on campus for the entire year, but individuals going abroad for one semester are also encouraged to apply. Students from all majors, interests, and backgrounds are encouraged to apply. You do not need to be an Environmental Studies major. Why should I become an Eco-Rep? As an individual in the Eco-Rep program, you will grow as a leader and as an environmental citizen. With each week in the program, you will develop your communication skills as well as your knowledge and understanding of your own impact on the environment and how you can train yourself, as well as those around them, to change their behaviors. This fulfilling and engaging job enables you to promote a sustainable future and will equip you with many of the leadership and practical skills necessary to become a sought after job candidate in the future. If you are passionate about the environment, the Tufts community, creating change, and working with a great group of new friends you can make a difference as an Eco-Rep! Sometimes, it can feel like there isn’t much to be done as an individual seeking to combat the state of our environment, particularly as courses gear up and overwhelm students with reading, problem sets, papers, exams, and stress. If you are feeling a little lost or can’t find your place in the environmental movement, or you just want to talk to really cool, interesting, and motivated Jumbos, be sure to stop by Carm and Dewick between 5pm and 7pm on Monday nights. 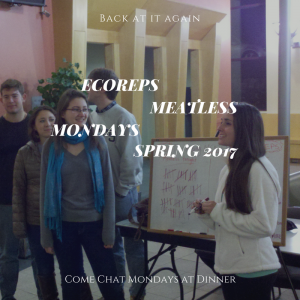 That’s right, this semester Eco-Reps are back at it again with the Meatless Mondays. If you’ve ever walked into the dining hall around this time before, you have probably noticed a table of eager Eco-Reps asking you if you’ll eat meatless tonight. This semester, be sure to say hello and talk to them about any of your environmental interests, comments, questions, or concerns. Eco-Reps are a wonderful resource to us students on campus. They are here to help and support us through our semester in a more sustainable way. Each week, they will be talking to us about different environmental themes, including topics in sustainable agriculture. Take this opportunity to learn more about ways that you can make a difference in your daily choices!